Hansi 8 dan Juyo Kinen Shibamoto Akira. Showa 54nen 3 gatsu hi. 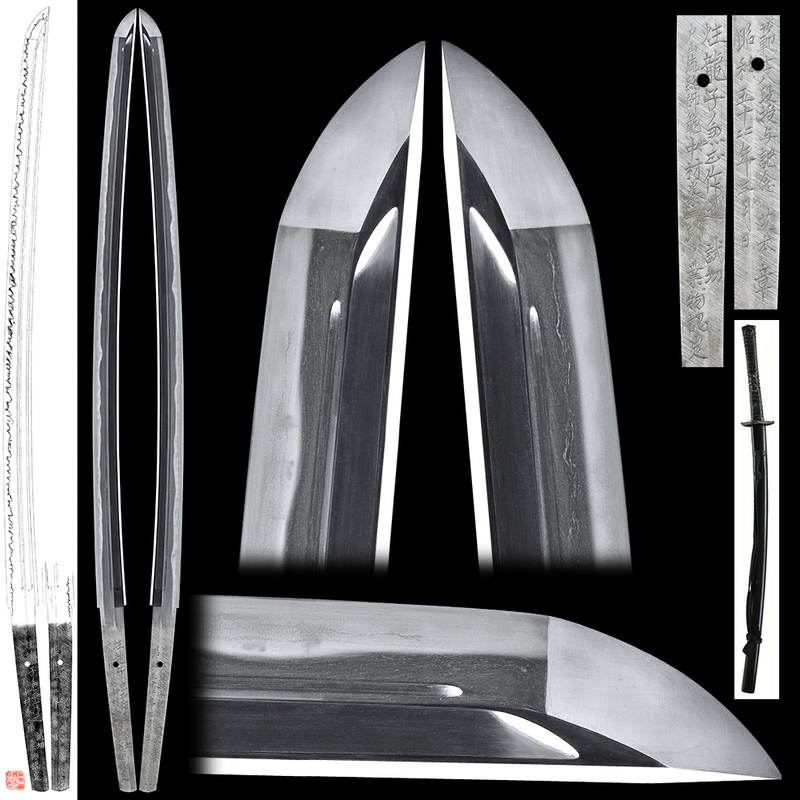 Exlanation: Shuryushi Kanemasa made this blade. Mr. Nakamura Taizaburo did Tameshigiri and recognized the blade as Wazamono. Mr. Nakamura Taizaburo is mater of Toyaka-ryu. As a memorial Mr. Shibamono Akira has passed the grand master 8th dan in March 1979. This Shuryushi Kanemasa belongs to Jyo-saku ranking. Blade length : 68.6 cm or 27.00 inches. Sori : 1.4 cm or 0.55 inches. Width at the Kissaki : 3.24 cm or 1.27 inches. Shape : Wide and thick blade. There is Bo-Hi and Soe-Hi on both side. Jitetsu : Itame Hada well grained with Jinie attach. Hamon : Nie Deki, Gunome Midare with Ahi. Boshi is Midarekomi style. he got Doryoku-sho prize and Nyusen prizes at the annual sword making competition held by the NBTHK. and the other four swordsmiths keeping high technique. This piece has wild activities in the ha. It is ideal for high quality Iai battou. He was a grandmaster of cutting tester Toyama school. He tried to cutting test by this sword and approved as Wazamono cutting test ranking. The sword was Tameshigiri by Nakayama Taizaburo. and judged as cut well sword as Wazamono ranking. The sword is nice balance and well grained Jigane and also Hamon. Tsuba : fold down the corner of the iron Tsuba, some designe with silver color. Fuchi: Shakudo, one line is engraved with copper color. Saya : Black Ishime Ji Saya.